Capable of printing at speeds up to 12" per second on two-sides of the bag, this programmable thermal transfer printer has been engineered to meet the latest, industry-specific printing requirements. 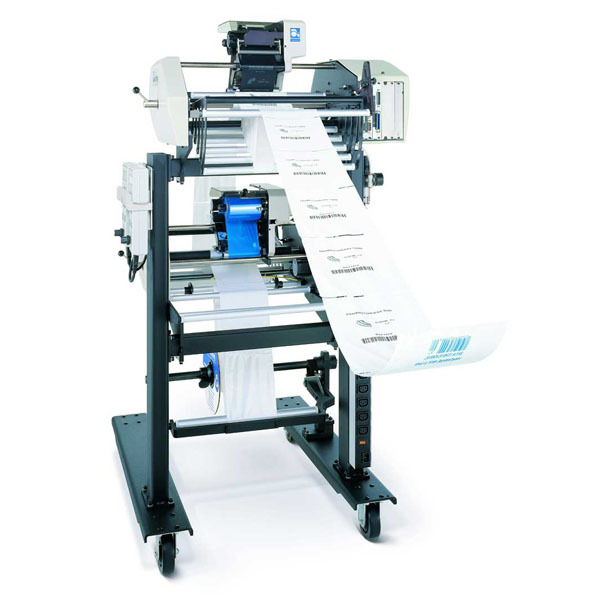 The PI 412cw Prism Imprinter is designed to provide flexible printing and packaging options, and can be configured for two-sided bag package printing, two-color printing on one side of the bag, or as a stand-alone imprinter. When used in conjunction with the Autobag® AB 180™ bagging system, product identification labels utilizing bar codes, text and graphics can be easily applied to individual packages in a simple Print-n-Pack™ operation. The AutoLabel PI 412cw Prism is capable of printing virtually all bar codes available today, including 2D bar codes and UPS MaxiCode. Label changes are fast and easy by simply accessing pre-stored label designs, or through database download with a PC connection. A large capacity, on-board memory stores job data for rapid package changeovers and maximum system uptime. The PI 412cw Prism uses system-matched AutoLabel Thermal Transfer Ribbon for optimum printing quality.